I’m a visual learner. Tell me what to do, and sometimes I get it. Show me what to do and I understand much better. What’s the best way to show someone how to do something? Make a video, of course! video2brain (v2b) has taken the concept of showing how to master a particular skill and has run with it. Formed in 2002, v2b has courses in English, German, French, and Spanish, with over 515 hours in English-language titles. A little background on how v2b works before I discuss the two courses I took. 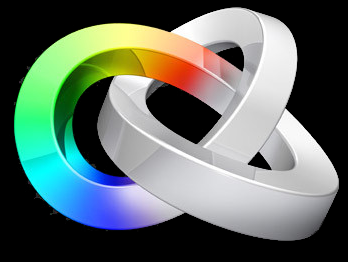 All courses are available to stream or download to your computer or iPad, and work with Mac, Windows, or Linux operating systems. Once you purchase a course, it’s yours; there are no expiration or “watch by” dates. 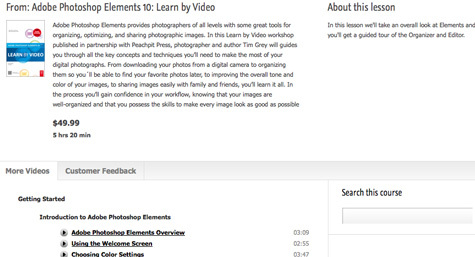 Since I’m trying to learn Adobe Photoshop Elements 10 (PSE10), I chose Adobe Photoshop Elements 10: Learn By Video and Getting Started with Photoshop Elements 10 as my courses for this review. As far as content is concerned, it isn’t necessary to take both these courses as a lot of information is repeated. 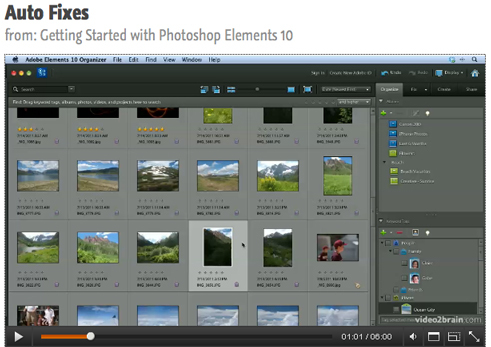 If you’re new to PSE10, Getting Started with Photoshop Elements 10 would be a great beginners course. However, if you have a little experience with PSE10 and want to dive deeper into the application, Adobe Photoshop Elements 10: Learn By Video is the better option. All courses can be accessed in three ways. The first is to watch it in your web browser. Videos can be viewed in a separate pop-up window, in full screen mode, or in a smaller mode. Below the video is a description of the course, price, course time length, and the breakdown of videos by chapter. Using a web browser is a great way to access courses when you’re not home; for example, if you’re learning a new application at work you can reference the course at the office. It’s a good idea to download your course onto your computer so you’ll always have it, especially when there’s no Internet connection. This is the second way to watch your course, through the v2b interface. 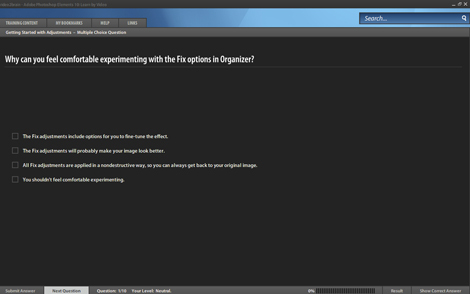 The videos are exactly the same as the online version, but there are distinct advantages to using the course on your own computer. Besides the above-mentioned availability factor, users can add searchable bookmarks as often as necessary to remember key points, similar to bookmarking a book. Also, at the end of each chapter is a fun test to check how much you’ve learned. HELP and LINKS are tabbed at the top of the video screen and are just a click away. Finally, videos can be viewed in “watch and work” mode, which shrinks the videos to a smaller size so you can follow along while using the corresponding application. The third way to view videos was my chosen way: through the web browser on my iPad. This allowed me to watch the videos and implement the techniques simultaneously in PSE10 on my computer. Users who don’t have an iPad can do the same thing using the “watch and work” mode in the v2b application discussed above. 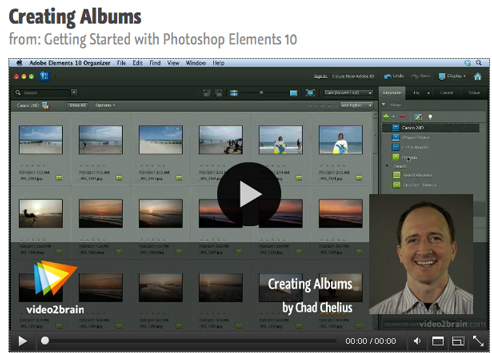 All project files are included in courses so you can practice techniques along with the teacher. This was extremely helpful, and made learning and understanding a concept much easier. Videos are short, and while they don’t have to be watched sequentially, it’s a good idea to do so, as many lessons build upon previous lessons. I found the videos interesting and focused on one point per lesson. I was amazed when an hour went by; it seemed like just a few minutes! For anyone who’s a visual learner like me, I highly recommend video2brain courses. They include all the files needed to complete a course; the Learn by Video series have a PDF bonus booklet with additional material to enhance the video training. The trainers with the two courses I completed, Tim Grey and Chad Chelius, are experts in their fields (as are all the trainers), highly knowledgable, and easy to listen to. 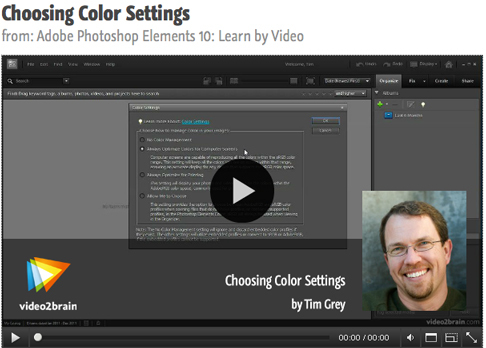 I’ll be referring to those videos frequently as I use and learn Adobe Photoshop Elements 10.
video2brain offers many free videos taken from all their courses. Sample one (or two), and you’ll immediately see the value of a video2brain course. It will be money well spent. NOTE: As I was preparing to publish this review, I discovered video2brain has an iPad app. After I downloaded it and signed in to my v2b account, my purchased courses appeared in the Dashboard, ready to view as I would in the browser of my iPad or computer. Users without an account may browse the course offerings, and watch trailers and free lessons. Yet another way to discover what video2brain has to offer.